The electric field immediately above the surface of a conductor is directed normal to that surface. 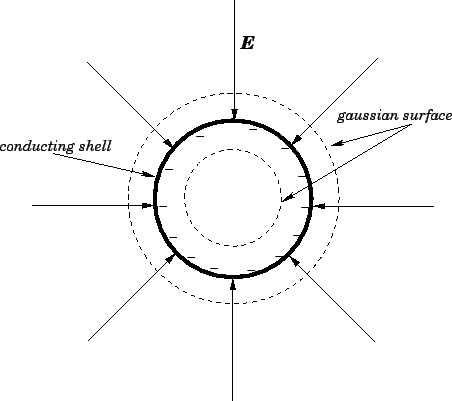 Figure 10: The electric field generated by a negatively charged spherical conducting shell. But, this is the same result as would be obtained from Coulomb's law for a point charge of magnitude located at the centre of the conducting shell. Now, a simple extension of the above argument leads to the conclusion that Eq. (69) holds everywhere outside the shell (with representing the radial distance from the center of the shell). Hence, we conclude the electric field outside a charged, spherical, conducting shell is the same as that generated when all the charge is concentrated at the centre of the shell. Let us repeat the above calculation using a spherical gaussian surface which lies just inside the conducting shell. Now, the gaussian surface encloses no charge, since all of the charge lies on the shell, so it follows from Gauss' law, and symmetry, that the electric field inside the shell is zero. In fact, the electric field inside any closed hollow conductor is zero (assuming that the region enclosed by the conductor contains no charges).